The News | VIP Bikes Hanoi - Motorbike Rental, Motorbike Service, Motorcycle Repair | Hanoi's motorbike rentals, service and repair. Recommended by local motorcycle tour companies, VIP Bikes can provide an excellent riding experience for your stay in Vietnam. We are sponsoring and promoting the Vietnam Swans AFL Grand Final day on Saturday 3rd October 2015. 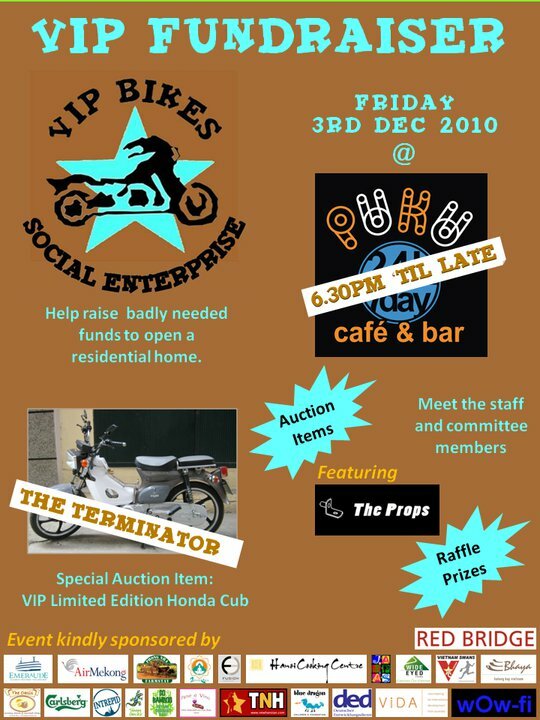 On Friday, December 3 starting at 6:00 pm there will be a VIP Bikes Fundraiser at Puku. Please join us for a night of fun at Puku Cafe to raise funds for the improvement and expansion of training for disadvantaged kids at the VIP Bikes training center. Lots of great prizes to win, and the auction of The Terminator – a fully restored vintage Cub. Come early so you don’t miss out! The Props will provide entertainment and of course Puku food, drink and fun available 24hrs! Tickets available for 150,000VND at VIP Bikes and Puku Cafe. Get your tickets early, as space is limited and initial reports indicate a huge crowd queuing up for the big night. More info via our Facebook page here.